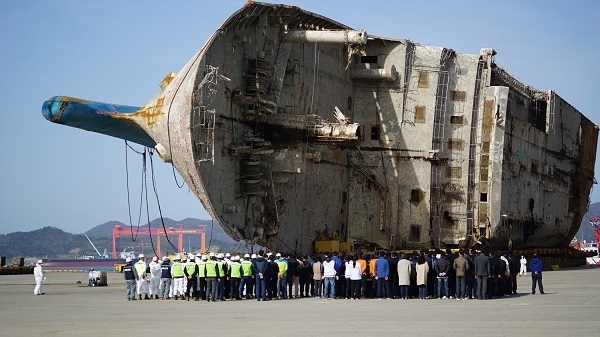 A complete search of the salvaged ferry Sewol is getting off to a slow start, with the authorities yet to draw up detailed plans. The Ministry of Oceans and Fisheries on Wednesday began drawing up the plans that will guide the search process beyond the initial stages. The search, which some experts say could take as long as two years, will begin following preparatory stages involving a number of precautions concerning safety and preserving evidence. The process began Wednesday, with the committee overseeing the search taking images of the exterior of the vessel. The images are to be used to gather and preserve information about the vessel’s present condition. Debris attached to the exterior of the vessel and protruding from damaged areas of the hull will then be removed. Once these processes are completed, the exterior will be cleaned with high-pressure equipment later in the week. Two 26-meter towers from which workers will access the vessel will then be constructed at the bow and stern. The towers will allow workers to enter from the skyward side -- the starboard which stands 22 meters above ground level -- to avoid possible accidents caused by structural failure. The authorities plan to send a reconnaissance team in Sunday, the third anniversary of the disaster, to test the environment inside the ship for possible dangers. Once the search takes off, workers will begin in the cabins on the third and fourth decks, the likely locations of the remains of the missing passengers. The search, however, will be a painstaking process requiring mud and debris inside the cabins to be removed before being analyzed.